After Rise of the Tomb Raider, Lara Croft’s adventure continues in an all-new Dark Horse series by Eisner Award–winning writer Mariko Tamaki! Lara Croft is pursuing a lost truth about the world that just might unlock the secret to defeating death! She becomes entangled in a search for a rare mushroom said to grant immortality and a lethal new enemy that just won’t die! 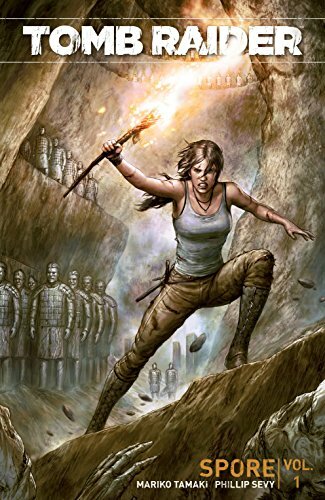 Collects the entire first arc of the Tomb Raider comic series, issues #1–#6. * A perfect jumping-on point for new readers! * Written by Eisner Award–winning author Mariko Tamaki. Following the events of Rise of the Tomb Raider, Tomb Raider: Spore has Lara Croft pursuing a lead on a world that might hold the key to immortality but along the way she meets up with a formidable enemy that wants that information for themselves. I’ve been a fan of the Tomb Raider games for years, mainly because Lara Croft is a more relatable version of Indiana Jones to me. I love that she’s getting more attention now than when I first started playing the games. Writer Mariko Tamaki does justice to the character, bringing her signature sass, courage and intelligence to the intriguing plot while Phillip Sevy and Michael Atiyeh bring her to life with their combined talents. I was fully engaged in the storyline even though this was the first time reading a Tomb Raider comic. The action and suspense were what I expected from a Lara Croft story and the illustrations were top notch. I’d definitely recommend Tomb Raider: Spore to other fans and for anyone who is looking for a tough, no-nonsense woman as a protagonist.